Since taking over as the full time writer of Spider-Man in 2010, Dan Slott has always had a penchant for thinking big and for not being afraid to break a few dozen eggs while making his comic book omelet. But while this devil may care attitude (especially as it pertains to what fans think of his stories) has always been a consistent part of his approach, it hasn’t always yielded consistently good stories (i.e., the highs of “Spider Island” and the first major arc of Superior Spider-Man versus the lows of “Ends of the Earth” and “Goblin Nation”). 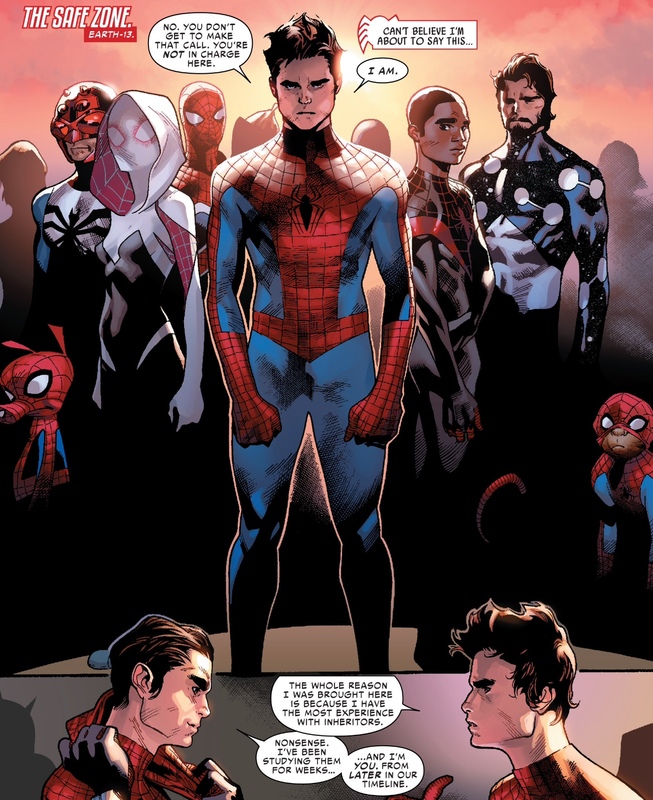 Amazing Spider-Man #11, the third chapter in the book’s latest event, “Spider-Verse” epitomizes the “good Slott” for lack of a better term. This issue is comic book event storytelling at its absolute finest, giving readers some long-awaited and demanded confrontations, some legitimate shocks, and some real, honest-to-goodness pathos that makes me care about this cast of far-out characters. And, oh, by the way, I’m absolutely desperate to see what happens next and I’m not sure I can wait two weeks to find out. Throughout ASM #11, Slott’s narrative is able to seamlessly switch between action, comedy, horror, despair and mystery, all while being careful not to overload the readers with too much (or too little) information at once – a legitimate problem found in some of his later issues of Superior. The world might be ending, but Slott is also being true to these characters – the bulk of them are just iterations (or analogues) of the same character, mind you – while also simultaneously displaying some interesting new wrinkles. 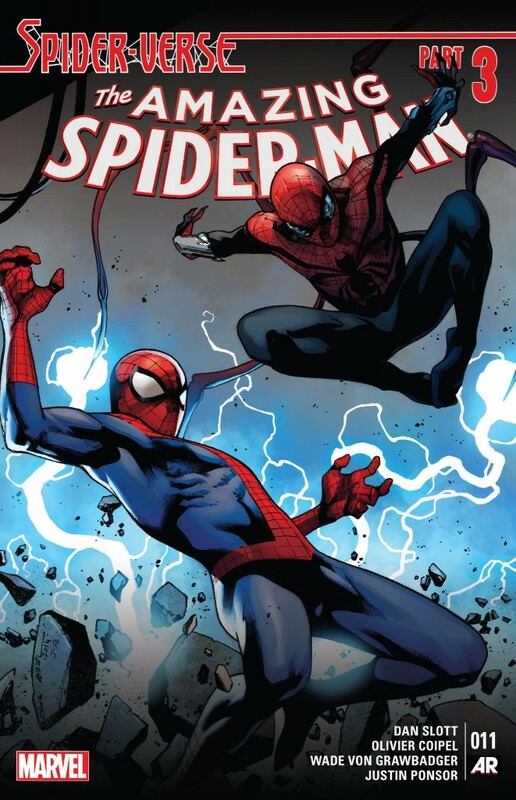 Slott is also thankfully assertive in how he kicks off this issue, FINALLY giving readers a nose-to-nose showdown between Peter and Spider-Ock. On a personal level, these were some of the most satisfying few pages I’ve read in a Spider-Man comic, in a long, long time. It could be argued that Slott and Marvel waited too long to give us this showdown for control between Peter and Otto, but at least ASM #11 offers a well-executed confrontation that has Peter actually reflecting on how this villain made a mess of his life, while also demonstrating intellect and foresight by acknowledging what an asset Spider-Ock is to the actual “war” they are fighting with the Inheritors. Otto meanwhile is at his arrogant best. I was initially wondering what Spider-Ock meant when he kept referring to Peter as a “younger” version of himself until Peter spells it out for the slow-to-catch-on reader: Otto is so damn egotistical, he can’t foresee a future timeline where he loses control of Parker’s body and disappears into the mindscape. These are the kind of character touches that made Superior such a joy to read over the first year of its existence. Meanwhile, Peter punches Otto in the face. And then karate kicks him. Thank you, thank you. While we’re at it, how about some affirmation for killing not really being a solution when it comes to the Inheritors? Thank you very much Dan Slott. This is the confident, in-control version of Spider-Man/Peter Parker that has been sorely lacking from this comic for quite a while now. In my write-up for ASM #9 last month, I speculated that perhaps “Spider-Verse” could emerge as the story that lets fans like me just unashamedly love Peter again. Dating back to the Stan Lee/Steve Ditko days, Spidey’s sense of humor has always read more as a defense mechanism and a possible deflection of insecurities, more than just a total disregard for the magnitude of a situation. And yet this all-jokes, all-the-time version of Spider-Man continued to persist in the Marvel Universe as if it was mandated by editorial. Maybe the stakes of “Spider-Verse” are so high, that even jokey Spidey ceases to exist. But I tend to think it’s just Slott rising to the occasion in how he writes the character. Bonus points for Slott giving us a quick exchange between Peter and Spider-Gwen, where both acknowledge their failings as they relate to the other, and (hopefully) planting the seed for more Spider-Gwen as this story marches on. Still, all of the various side missions involving the likes of the Scarlet Spiders, Spider-Man 2099, Spider-Woman and others, tend to drag the speed and pacing of the narrative down a peg or two. It’s not that I don’t care what these characters are up to, but as is often the case when a Slott comic becomes too bogged down in subplots, these check-ins feel more obligatory than story-serving. However, ASM #11 pays off these diversions with a fantastic homage to the 1960s Spider-Man animated cartoon. I’m not entirely sure if artist Olivier Coipel provided the pencils for the Spider-Man ’67 sequences, but whoever did, captured these visuals perfectly. Slott’s jokes about only one New York City building having a sign on it, and skyscrapers having just six windows across added just the right smidge of levity considering the emotional hammer he was about to drop down on us in a few pages. 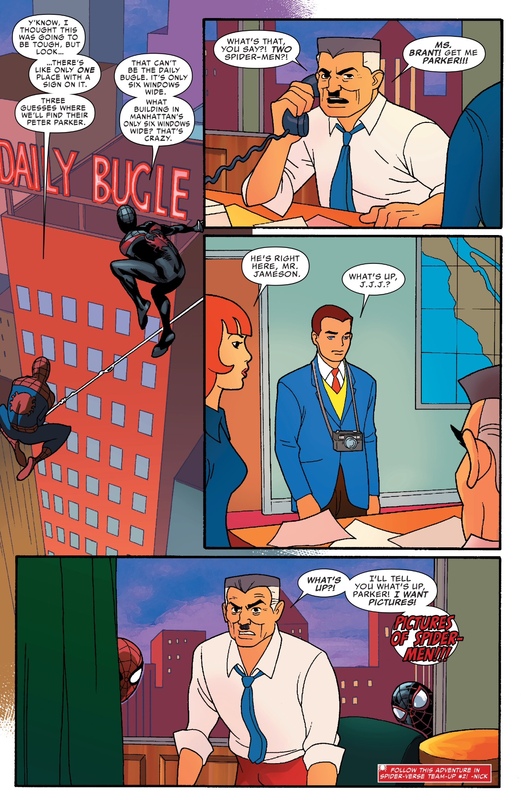 First, Slott resolves one mystery – how the Inheritors mange to keep rehabilitating themselves – by introducing us to another mystery when he cuts to a scene featuring, what I’m assuming is, alternate versions of Miles Warren (the Jackal), Spencer Smythe (the Spider Slayer) and Marla Madison (J. Jonah Jameson’s wife in 616). That would certainly explain how a bunch of mystical totem-slayers have an endless supply of clones of themselves, but it also begs questions about how these new characters will factor into the resolution of this story (not to mention how in the world will the Spiders be able to stop such powerful foes who are backed by such relentlessly insane scientists?). And then there’s the introduction of a new Inheritor, Solus. 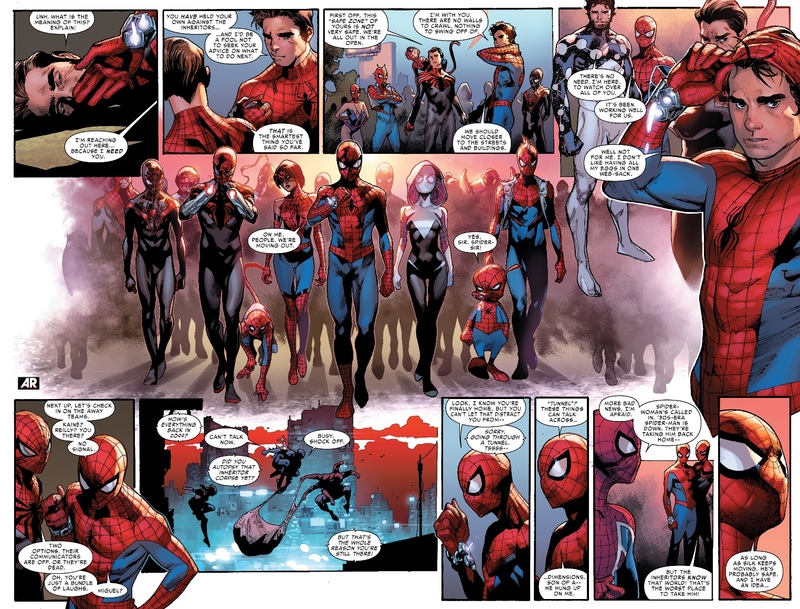 As interesting and fun of a concept “Spider-Verse” has been so far, I’ve long maintained that the strength of the story would be tied to how the Inheritors would be ultimately characterized. Slott has to walk a fine line between establishing these villains as a potential world-ending threat and also demonstrating some chinks in the armor that will allow Spider-Man to (presumably) emerge victorious. With Solus, you unquestionably have the former there. My goodness, this character feels like he’s straight out of my nightmares, and his showdown with Captain Universe Spider-Man elicited the kind of despairing response from me that I tend to reserve for “Luke, I am your father” and Han frozen in carbonite moments. This gut-wrenching battle is then followed with a revelation of who the mystical “Scion” is – and those of us who are boned up on our SAT words were not too terribly surprised by the unveiling. But I also have to tip my hat in how Slott is keeping the momentum of his story rolling downhill and not getting caught up in being too cute in how he strings along certain mysteries. As for the “hope spot” of the comic, we get another look at lonely old Karn, who is killing totems like nobody’s business and getting no appreciate for his work. 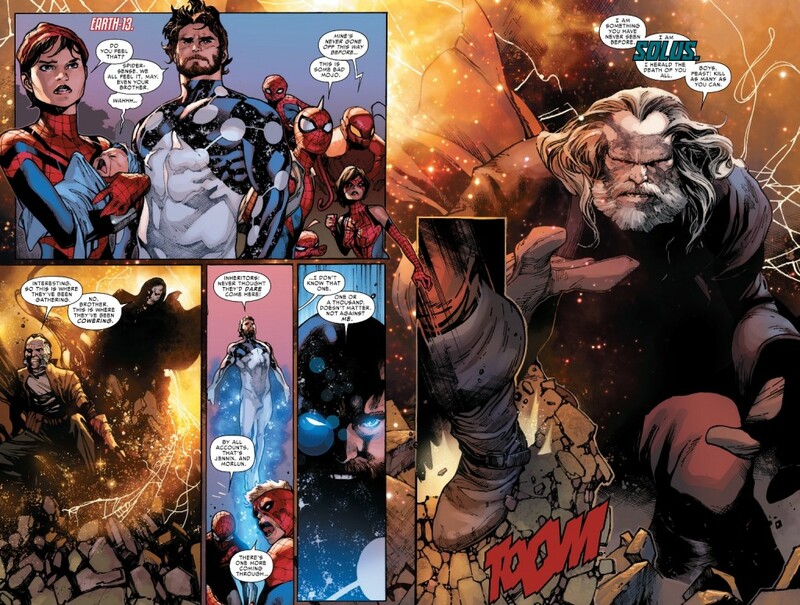 Slott still hasn’t established a clear path as to how this character might turn on his fellow Inheritors, but every appearance he makes feels like another bullet being placed into Chekov’s gun. With things seemingly at their worst for the Spiders by the end of this issue, I expect that gun to fire sooner instead of later.